They say a picture is worth a thousand words. If so, then the aforementioned picture should be a thousand words about why HBCUs are African America’s best opportunity for access and opportunity. Unfortunately, the logic the past 60 plus years when a picture like this has surfaced is that African America must try harder or do better to gain access or that even presence of one or two of us is success. 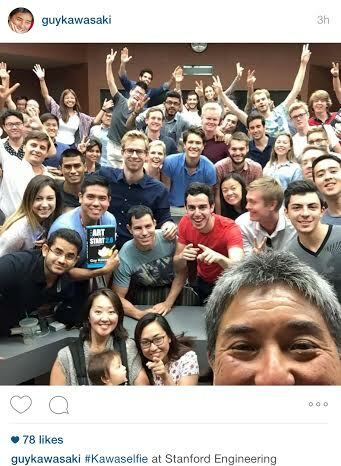 The picture itself shows Guy Kawasaki, one of Apple’s early employees who is now a Silicon Valley angel investor, and an engineering class at Stanford University. Stanford is without question one of America’s premier research universities ranking eleventh with almost $1 billion annually in research expenditures. It is the university that laid the ground work for Silicon Valley itself to come into existence as well as being the environment that produced Google. Sergey Brin and Larry Page, Google’s co-founders, met there while studying computer science doctorates. Stanford also has one of the country’s largest endowments with $21.4 billion – an amount that is ten times all 100 plus HBCU endowments combined just for perspective. 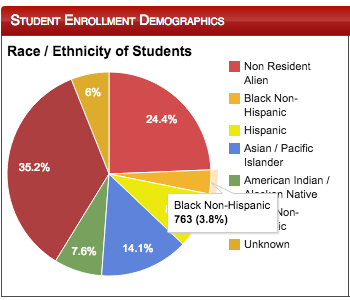 Yet, despite this treasure trove of resources the school’s demographics (see below) do not even come close to matching the African American population in the state of California (7.2 percent) or the country (13.2 percent) as a whole. African America does not seem to truly understand the value in investing in its own institutions as other groups seem to in their own. We often do what is best for America, while other groups do what is best for themselves. HBCUs still produce the majority of African American professionals in America. In the engineering field alone, HBCUs currently produce 40 percent of African American engineers (see below) while only constituting three percent of America’s colleges and universities. The value of these institutions is unquestionable, but that value is not marketed or conveyed consistently to African America so that the community truly understands the value and importance of the opportunities provided through the institutions existence, the opportunity they provide, and why they need more attendance and financial support from African America itself. HBCUs themselves must also continue to build their programs. There are new fields of engineering to explore. Fields like bioengineering, space engineering, and other emerging engineering disciplines must be offered. HBCUs must think beyond just the basics of chemical, electrical, and mechanical engineering. Premier HBCU engineering programs like North Carolina A&T State University (see below) truly are at the forefront of this expansion and other HBCU engineering programs must forge ahead. They must also continue to expand their research on the graduate level. Research among the top 20 HBCUs constitutes only $450 million in research expenditures, again while a university like Stanford does almost $1 billion alone. Much of the true innovation that happens in the US and around the world happens at the graduate level where the intellectual cream meets. There is no reason that the brightest minds from HBCU undergrads should have to leave the HBCU ecosystem or miss out on opportunities because our graduate schools are an after thought of leadership. We need our intellectual capital to circulate and remain within our ecosystem. 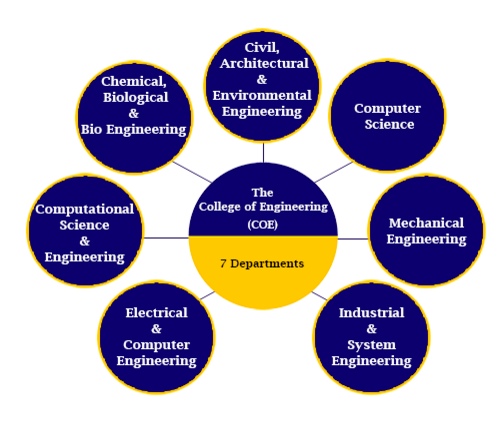 The next Google, Facebook, or Microsoft lies within an HBCU engineering department. Perhaps it will be HBCU engineers that will help put the first African country on the moon, Mars, or beyond as they once did for NASA and America. HBCU engineering departments may come together and create our version of Silicon Valley. Whatever the future holds, as Dr. John H. Clarke said, “I am saying what ever the solution is, either we are in charge of our own destiny or we are not in charge. On that point we got to be clear, you either free or you a slave.” A picture is worth a thousand words, but we only need to remember a few, the power to be free is in our own hands, hearts, and minds. This entry was posted in Editorial and tagged guy kawasaki, hbcu engineering, north carolina a&t state university, stanford university. Bookmark the permalink.